CANTON, MA (November 4, 2013) – With the holiday season approaching, Dunkin’ Donuts, America’s all-day, everyday stop for coffee and baked goods, is kicking off the most wonderful time of the year with new and favorite holiday beverages, snacks and gifts to make everyone’s spirits bright all day long. Dunkin’ Donuts’ special seasonal selection includes three flavored lattes, including a new Red Velvet Latte; a full lineup of smooth and creamy hot chocolate varieties including new Salted Caramel Hot Chocolate; and holiday-themed donuts including Red Velvet Drizzle Donut and Holiday Star Donut. Dunkin’ Donuts also offers Peppermint Mocha and Hot Cocoa K-Cup® packs and packaged coffee to enjoy at home during the holidays. Finally, for fun, festive and affordable gifts, Dunkin’ Donuts has limited-edition holiday ornaments, Dunkin’ Donuts branded mugs and tumblers, gift baskets, and more. 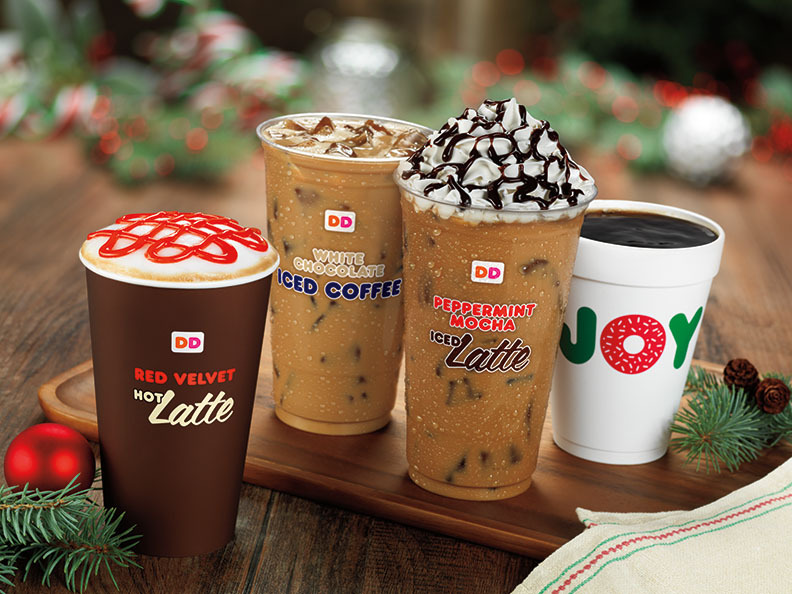 Holiday Coffee and Lattes, including new Red Velvet: Boost holiday spirit with Dunkin’ Donuts’ lineup of flavored coffee and lattes. Try a new Red Velvet Latte for the indulgent, sweet taste of red velvet cake and cream cheese frosting, topped with a festive red drizzle. Also available are classic holiday favorites Peppermint Mocha and White Chocolate. All of Dunkin’ Donuts’ coffee and lattes are available hot or iced. Salted Caramel Hot Chocolate: For a fun and satisfying holiday treat, Dunkin’ Donuts’ new Salted Caramel Hot Chocolate offers a blend of sweet and salty flavors in every sip. Dunkin’ Donuts also serves several other varieties of hot chocolate to help on-the-go people treat themselves during the holiday hustle and bustle, such as Mint Hot Chocolate, White Hot Chocolate, Dunkaccino® and classic Hot Chocolate. Peppermint Mocha and Hot Cocoa K-Cup® packs and packaged coffee: Perfect for holiday parties or gatherings, and sold exclusively at participating Dunkin’ Donuts restaurants, Dunkin’ Donuts’ Peppermint Mocha and Hot Cocoa K-Cup® packs make this favorite holiday flavored coffee available at home for use with the Keurig® K-Cup® Brewing System. Guests can also enjoy Peppermint Mocha packaged coffee in a special, limited time only 8-oz size. Red Velvet Drizzle Donut: Dunkin’ Donuts’ Red Velvet Drizzle Donut is a glazed red velvet cake donut with cream cheese icing drizzle. Holiday Star Donut: A star-shaped, Bavarian Kreme-filled donut topped with green icing and white star sprinkles. For a fun and affordable gift that can keep friends, family and co-workers running through the holidays and well into the New Year, Dunkin’ Donuts Cards are available in a variety of holiday and winter themed designs. Dunkin’ Donuts Cards can be purchased at any participating Dunkin' Donuts locations in amounts from $2 to $100, as well as online at DunkinDonuts.com, and at many grocery, pharmacy, and big box retailers. Dunkin' Donuts Cards always have no fees and no expiration date. Finally, to help keep people connected as they keep themselves running throughout the hectic weeks ahead, almost all U.S. Dunkin’ Donuts restaurants offer free hi-speed WiFi access. For anyone seeking a place to check email or browse the Internet while enjoying delicious food and beverages, Dunkin’ Donuts is now the ‘hot spot’ to keep running both online and offline through the holiday season and beyond.